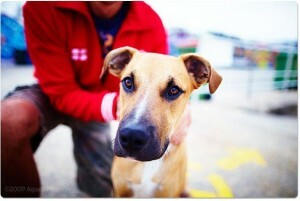 Mac is a beautiful and charming one-year-old Mastiff cross. When Mac came to visit us at Vet HQ one day for an injection he passed awful smelling diarrhoea right in the middle of the waiting room. He was so embarrassed, and so was his Dad, Simon. Unfortunately diarrhoea can strike at any time and it is never pleasant. There are many causes ranging from a sudden change in diet; worms; infections (Giardia, cryptosporidium, Salmonella, Parvovirus, Coronavirus – to name a few); bowel problems to many more severe causes. In Mac’s case, the cause was a combination of a sudden change in diet and whip worm. 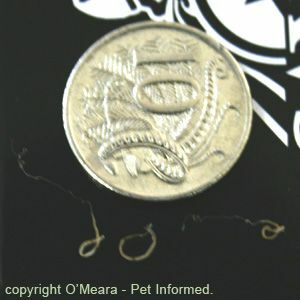 There are 4 major intestinal worms in dogs and cats – they are the round, whip, hook and tapeworms. Worms are normally introduced into the body by eating worm eggs either in faeces or in contaminated soil, licked off the skin or paws or inadvertently ingested through contamination on food. 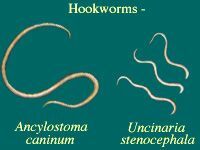 The hookworm can also infect through penetration of the skin. 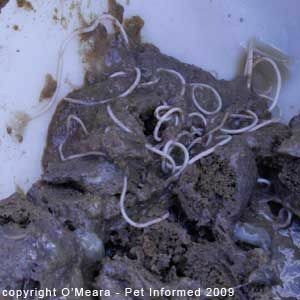 Worms may also be transferred from mother to puppy through the placenta or breast milk. The time between infection of the host and the earliest time at which the eggs or larvae can be recovered from faeces is called the pre patent period. This period varies between the worm types and can be as short as 2weeks. Although we recommend worming every 3 months, we must remember that these tablets do not continue to work for 3 months in advance, but will kill worms in the gut only on the day the tablet was given. The confusing factor is that worming every 3 months may not stop those worms with short pre-patent periods from producing eggs and thus infecting the environment. When we know an animal has an active infection i.e. worms in poo or eggs detected on faecal test we MUST worm every 2 weeks for a period of time (varies between worms) to ensure the infection has been cleared. Thankfully, Mac has recovered and recent poo examinations have cleared him of any ongoing worm infections. Products Available for Worm Control. Some products protect against intestinal worms as well as heartworm. Heartworm is spread by mosquito bites and can cause heart failure and death. Intestinal worms can infest an animal even when worming tablets are given every three months.